As of tomorrow, the longest flight in the world will shuttle passengers on a 747-400 from Sydney, Australia to Dallas, Texas. That 15-hour, 25-minute hop on board Qantas 7 may not be the lengthiest in duration, but at 8,578 miles gate to gate, it'll lead the industry in miles flown. For a few more hours, however, Singapore Airlines' decade-long run from Newark, N.J., to Singapore remains the record holder for both time (more than 18 hours) and distance (9,534 miles). It's a journey that's been on the bucket lists of the world's most ambitious aviation enthusiasts since the city-state's namesake airline first launched the service in 2004, and following tonight's final jaunt, this record-setting A340-500 will touch down at Changi Airport for the very last time. Despite this cheerless loss, it's a spectacular time in the world of aviation. Sure, we don't have our supersonic Concorde replacement just yet, and the Dreamliner rollout was not without significant heartbreak, but the past few years have represented a tremendous period, with banner launches from both Airbus and Boeing that will change the way we fly forever. But as with any category, aircraft manufacturing and design advances also serve to highlight the shortcomings of previous-generation products. The Airbus A350 and Boeing 787 make massive efficiency boosts a reality, leading gas-guzzling greats like the aging A340-500 to a premature retirement. In this case, the A345's departure from Singapore's fleet represents not only better things to come, but also the loss of a landmark route -- it's an unavoidable compromise, and with the end in sight, I drained my frequent flier account in order to score a ticket, and set out to discover the significance of Singapore Flight 21's retirement. With just 100 seats on board, the all-business-class flight primarily serves deep-pocketed globetrotting executives -- many work in the banking industry, often splitting their time between Singapore and New York. 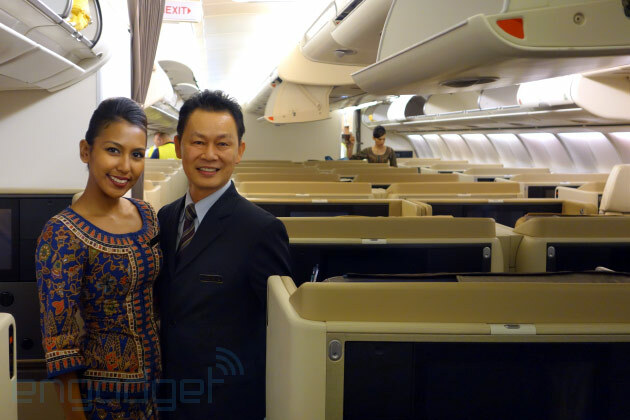 (Singapore Airlines retired a similar-length flight from Los Angeles last month.) The nonstop route saves travelers three hours or more over connecting options, including Singapore 25, which has a two-hour layover in Frankfurt. Those three hours, at least for the airline, weren't enough to justify keeping the A345 in the air, due in no small part to the enormous expense of carrying the additional gas necessary to ferry passengers without a requisite refueling stop. After boarding through Newark's aging Terminal B, our flight departed around 11PM on November 14th, landing two days later at 6:20AM local time in Singapore. 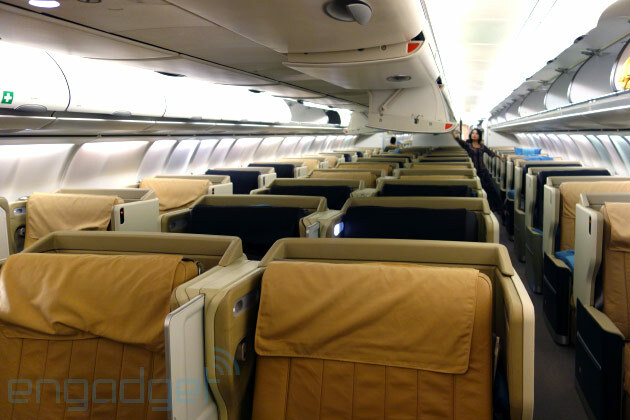 All 100 seats on the A340-500, less those in the last two rows, are arranged in a 1-2-1 configuration, affording each passenger direct access to the aisle and an incredibly generous seat width of two and a half feet. 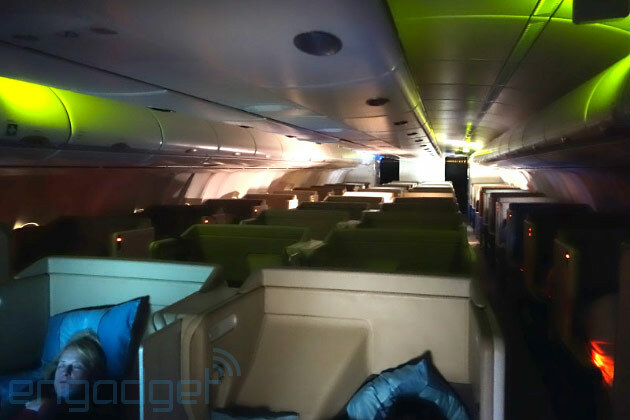 By comparison, Emirates, which also operates the -500 variant, squeezes an extra two business seats into each row, and carries coach passengers in a 2-4-2 configuration. I snagged a window seat in the third row -- 14A -- so as to avoid light from the galley and noise from the aircraft's four engines, humming away some 100 feet behind. It ended up being a perfect fit, but despite the comfort of a large, 15.4-inch in-flight-entertainment system, tons of legroom and a flatbed seat, I was eager to deplane with nearly 15 hours left to go. But back to the beginning. Despite our flight originating in the US, Singapore Airlines doesn't yet allow gate-to-gate personal electronic device use, so I rushed to fire off a few final emails and Instagram photos as the remaining passengers made their way to their seats. A few hours after takeoff, I pulled out my laptop somewhere over Newfoundland and connected to the OnAir satellite WiFi service. After paying $29 for 30MB of internet usage, I caught up with email using the low-bandwidth Gmail mobile site. I spent the next six hours sleeping, tweeting and checking email, and I decided to lift the window shade when the in-flight map showed that we were positioned 35,000 feet above Warsaw. Daylight filled my seat halfway through the flight, so I went to the galley to chat with the crew, asking flight attendants about their experiences with the A345, and whether or not they'd miss working on the plane. The staff seemed to be trained to avoid such questions, as politely as possible, and each attendant I spoke to provided a brief response before changing the subject, always insisting that I have more to eat and drink, instead. 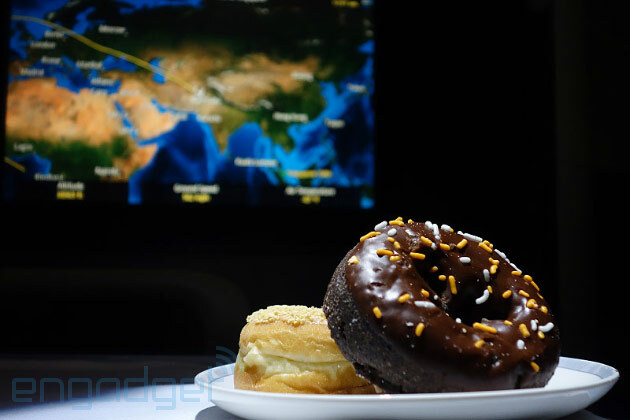 Oddly, Singapore caters this flight (and only this flight) with a few boxes of Dunkin' Donuts, and since no SQ21 experience would be complete without one, I made my request. Some hours later, I returned with a few more questions, this time turning down offers for more food. Sadly, the crew only offered up a few minor details. Not surprisingly, they loved the plane, and really enjoyed flying that route. One of the attendants on my flight said he works the A340 once every six weeks, and this was that crew's final trip. I had plenty more blanks to fill in, but it seemed inappropriate to ask, for example, whether the on-board "corpse locker," which was installed to avoid diverting should there be a fatality mid-flight, had ever been used. I figured questions about passenger loads would also be rebuffed, though a quick tour of the plane confirmed my suspicions that this particular flight was sold out. Ultimately, I felt awkward querying the crew about the end of their beloved flight, so I returned to my seat for some in-flight movies, TV shows on my laptop, another meal and a bit more sleep before our arrival in Singapore many hours later. There are a variety of reasons for Singapore's decision to retire the world's longest flights -- rising fuel costs, limited passenger loads, competition from other airlines with just one connection -- but a company spokesperson told me the carrier's official position is that Airbus offered a repurchase deal for the A340s that was too good to refuse. In exchange for returning the five planes to Airbus, the airline is able to grow its fleet of flagship A380 superjumbos, which are used primarily on flights to Europe and the US (via Tokyo and Frankfurt), at a significant discount. Is a nonstop from Newark to SIN technically possible without the A340? Yes; Boeing's 777-200LR can travel that distance, but Singapore doesn't have that aircraft in its fleet. There's always a chance that the airline may add the extended-range Dreamliner, the 787-9, at some point, making the Newark route possible once again. But even so, I'd probably opt for a one-stop routing instead; 18 hours is simply too long to spend in one seat, and I'm no more eager to travel with an inflated carbon footprint than Singapore Air is to pay for the extra fuel. In fact, I had the option of returning to New York on nonstop Flight 22, but I instead opted for a routing through Delhi and Frankfurt on Singapore and Lufthansa, giving me a chance to stretch my legs every eight hours or so. And I'll do the same on future trips to Southeast Asia, without hesitation. Flight 21's retirement is an unquestionable loss for commercial aviation, but with this sacrifice comes immense potential. Thanks to its smaller size and significant efficiency boost, the 787 enables reduced-load routes, like Denver to Tokyo or Houston to Lagos, Nigeria. And like the Dreamliner, the A350 will bring even more new direct flights, too, when that aircraft takes off in 2014. As for this nonstop to Singapore, if you're eager to spend upwards of 18 hours on the same plane and you have $5,000 burning a hole in your pocket, there's still time to snag one of the very last seats. The final flight departs tonight, so head over to the airline's site, pack your bags and become a part of history.